The First Wave Trader TEMA Crossover indicator is now available for NinjaTrader 7 and TradeStation version 8.3 and higher. This indicator is available individually or bundled with Fisher Stochastics for a discount. The First Wave TEMA Crossover is a trend indicator and can help to keep you in trend when other indicators might advise traders to prematurely exit a trade. This study was developed by Kirk Johnson (CaptKirk) and John Boren (Bobcat). 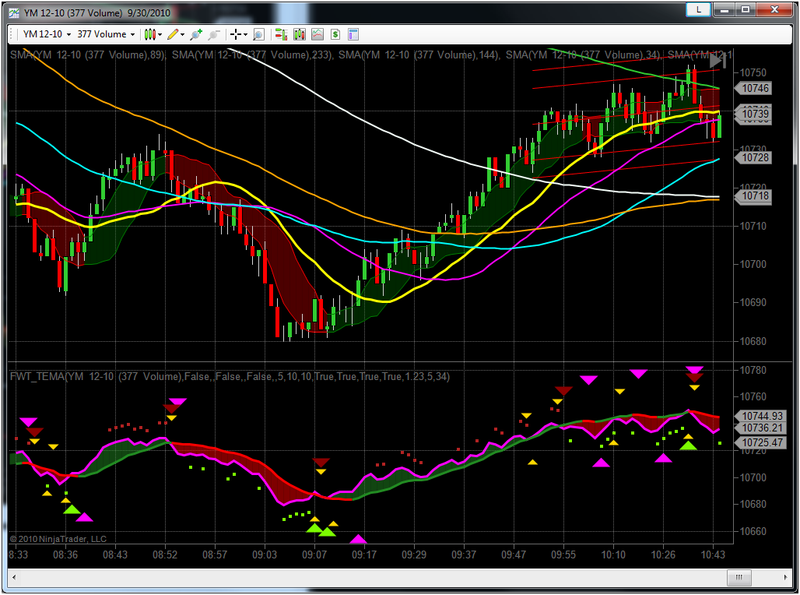 This study is available for both TradeStation and NinjaTrader 7 trading platforms. 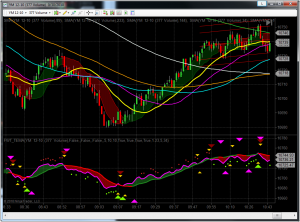 The following signals are available in the Ninjatrader version. Green / Red Trend Line – In the indicator, notice the green or red trend line. That will indicate the current trend since the last crossover. Purple Arrow – This indicates when the two TEMA trend lines have crossed. This indicates the point in which the trend may have changed. Green / Red Arrow – This indicates when slower TEMA moving average crosses a faster TEMA moving average. This often can indicate an early change in direction. Yellow Arrow – This indicates that price crossed the slower TEMA moving average. Green / Red Dots – This indicates that the faster TEMA moving average is moving closer to the slower moving average. This often can indicate that price movement is slowing. Due to user interface limitations, the TradeStation version has fewer signals, but most can be can be inferred from the two TEMA lines. In addition to the two TEMA lines, the TradeStation version also includes a signal for when price crosses TEMA since this is one of the few signals that could not be otherwise seen. The NinjaTrader version requires the installation of a license file. To learn more about Ninja Trader licensing, read Ninja Trader License Information.